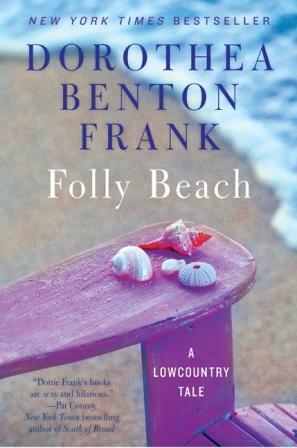 My first introduction to Folly Beach was some time ago when I read a book with a similar name. So when I saw that there was a story by Dorothea Benton Frank about the loveable place - I had to check it out. If I am being honest (which I always am, I hope you know!) it really took me some time to get into the story. The initial scenes from the play were nearly impossible to understand. Not so much the writing, but the purpose. Why was I jumping back and forth between a character like Cate to a woman who came up out of her grave? Was this a dream? Where WAS I? Where had Ms. Frank actually planned on taking us? It really took me a while to get through this book because of this initial stuff. Once I passed some of it and made the connection, things started to come together. The story started to fly by. Let me tell you more - and - as always - I'll take care not to give too much away! Cate is the primary character of the novel, and we meet her after her horrific husband has committed suicide over her beloved piano. We find out what a swindler he was, how much he has taken from her and her family, and what little remains for her to move forward with. But Cate has a favorite Aunt Daisy who lives on Folly Beach with her lovely Ella and is more than ready to welcome in her niece with open arms. We follow Cate home to Folly - the place she grew up - and join her on her journey to finding herself. I can't even say again, as it seems like she never truly found herself in her marriage. She is a mom, and loves her children (grown - one about to have a child of his own), but isn't true enough to herself to feel real. The fold in of the story of Dorothy and Dubose is an interesting one. As I mentioned, it doesn't take hold of you as a reader until the stories twine together. Ms. Frank did a great job at culminating in a point where the connection made sense. For a while I felt strung along - confused - but then I recognized that as it came clear for Cate, it came clear for us, as well. Overall I would say I enjoyed the book. Enough to make me comfortable picking up another of her stories, but not necessarily enough to seek out her next novel. Not until I know more about it, anyway. Thanks to TLC Tours for a copy of this book to facilitate my review. All opinions expressed are entirely my own. I was not compensated for posting this review in any way. I'm glad the story eventually captured your attention! Thanks for being on the tour. I know some people don't like to read a book's synopsis or know much about a story before they read it, but I like to know the general premise and a few details because I feel like it helps me get into the story quicker and it makes following the storyline easier.